This photo was sent to me by a fellow gardener and all I could say was ‘wow’! Every year this gardener sends me pictures of her beautiful Pamela Crawford baskets. 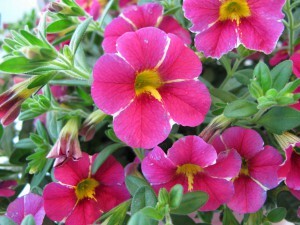 Typically she plants them up with Superbells® and Supertunia® for her summer garden, this year was no exception. But when I received this photo in November I was in awe, she did a follow up Fall planting. 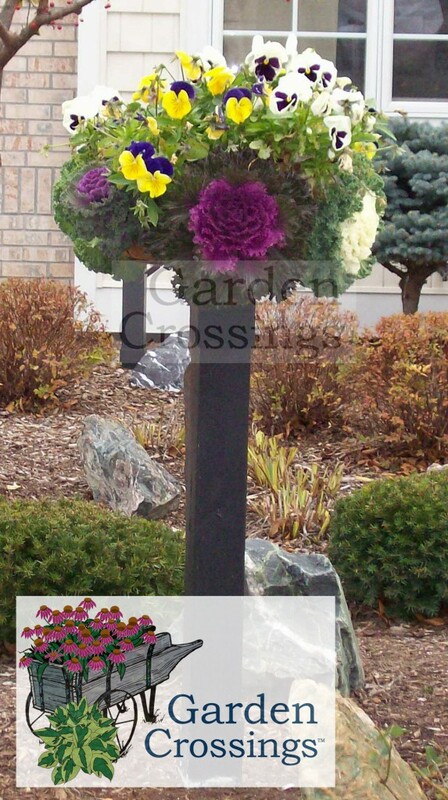 Here she used kale, pansies, and cabbage for this great Fall look. The color combination is truly stunning. So my advise to you… just because the planting season seems like it is done, it may have only begun. Make sure when you are ready to be ‘done’ planting for the season, that you ‘Think outside the ‘box’. 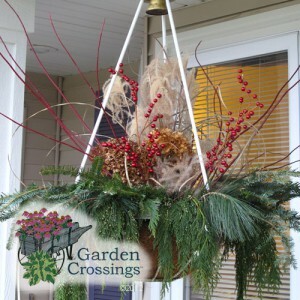 So Winter is here and you may think what do I do with my empty hanging baskets? 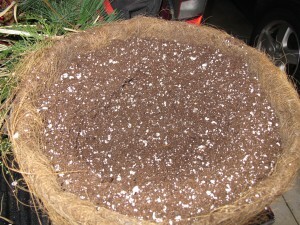 My answer is ” Well fill them, of course!” Just because it is to cold out for live plants that does not mean that you baskets need to go empty all winter. ( If you choose to do nothing with your baskets, please do your gardening neighbors a favor and dump the dead annuals in the trash) Here I have gathered a few items from my garden to fill this basket. 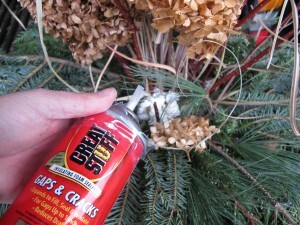 I have taken a few pictures along the way to show you how to make your ‘planting’ go a little easier and also help keep the ingredients from blowing away in the harsh winter breeze. 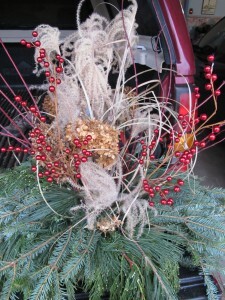 As you add in Red Twigs and Hydrangea spray some more great stuff in the middle. 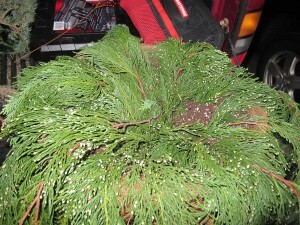 After the foam has been sprayed i recommend breaking some pine needles off extra branches to cover up the foam. Once you design is complete, let it set as the foam dries. 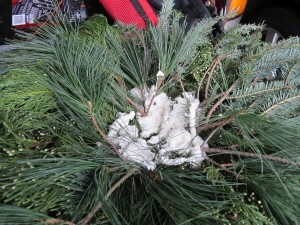 The foam should hold all your decor together to withstand the winter elements. There’s a new filler in town! 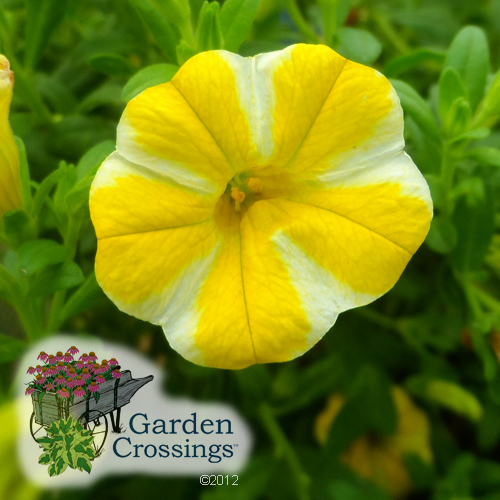 Make ‘Sweet Caroline Raven‘ Sweet Potato Vine your go to plant for filling in your annual combinations. 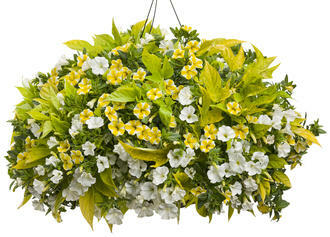 For many years the standard filler/spiller has always been Bacopa, Creeping Jenny, Licorice Vine, etc. , while these all make for a great filler, why not try some thing new and different? ‘Sweet Caroline Raven‘ has gorgeous, lacy, black leaves that can trail up to 3 foot if you let them. 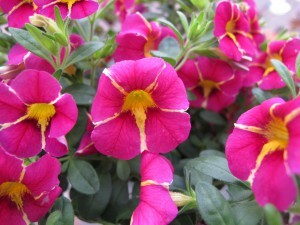 They intermingle well with Supertunias®, Superbells®, Geraniums and almost any other annual you can envision them with. The dark black foliage really makes other colors ‘pop’ from the contrast. Garden Crossings will be using tons of this Sweet Potato Vine in our baskets this year. Below are just a couple examples of combinations we will be using.